No Trivia - Happy 4th of July! Happy Fourth of July! 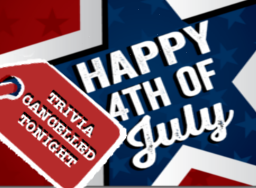 Trivia is off tonight at all of our venues. We hope you have a wonderful Independence Day! Trivia will be back on tomorrow. For your trivia fix in the meantime, listen to the We Don't Know Either podcast!